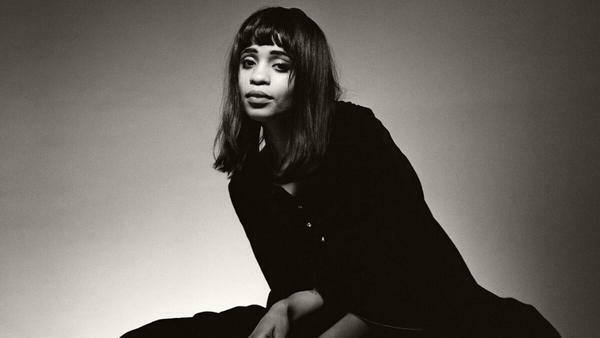 Adia Victoria is a Nashville-based singer and songwriter who sounds nothing like what we think of as Nashville. "Nature terrified me: the constancy of it and its cold disregard for mankind," she says. "I don't think that I could ever try and 'aw shucks' that up, folksy that up. I would never disrespect what nature has meant to me and be like, 'Oh, you know, I'm just a country girl.'" In her song "Sea Of Sand," the artist — who goes by her first and middle names — sings about the time a river swept her precious patent leather shoes right off the bank. Those were her church shoes, and they saw a lot of use. For years, life revolved around her Seventh Day Adventist congregation. She and her siblings even attended the church school. And the hymnal was Victoria's main source of music. "So I kind of had this veil shrouded around me," she says. "But there still were small ways that the world would break through the veil. I remember Michael Jackson as a little girl. I was like, 'He's not like us. Have you seen him dance?'" She got thrust into that secular world when her single mom put her into public high school. But Victoria couldn't identify with her schoolmates' comfortable suburban lives as a young woman of color in a family that often struggled to get by. "I just realized, 'Okay, wait a minute. Whatever it is that you're trying to sell, I don't want this. I don't want my life to look like this,'" she says. "So when I went to high school, it was with this attitude of, 'Okay, I have to be here by law, but I'm not going to sing and dance for you, and I'm not going to impress my teachers. I don't care about letters of recommendation.'" Victoria dropped out of school, and wanted out of the South altogether. She saved up for a plane ticket to Paris, determined to learn French. Then she caught a train to New York to try Northern city life. But by 21, she'd moved to Atlanta and fallen for delta blues. "I heard black inner lives for the first time," she says. "I heard this kind of soundtrack to what I was already going through. It was just like: Y'all went through it too! You've been tried by the same fire that I've been tried in, as a black Southerner. I was like, 'I need someone to tell me who I am. I need to see what I'm going through out there.' So I had to go back about 80 years, but I found it." At first, she only played her songs for her cat. After she joined her mom and sisters in Nashville, they overheard her singing and started requesting their favorites. But it took an awakening for Victoria to get serious about putting her music out there. "When I saw that the things that I was singing about," she says, "that were frustrating me — I was seeing it played out on the news with the Black Lives Matter movement, and Trayvon Martin, and Sandra Bland, and Tamir Rice — I was just like, 'Okay, I have to say something. I have to put myself out there, because my art is speaking to what's happening now.'" Victoria's presence was so powerful that drummer Tiffany Minton offered to join her band before she'd even heard the music. Just talking with Victoria made that much of an impact. "What she's saying is challenging for a lot of people, particularly white people, which tends to be a lot of our audience," she says. "So it draws them to a place of defensiveness or disconnection. I think she's able to challenge them with grace and dignity, but also with a fierceness, without apology. I love that she stands up for herself and her artistic vision." By now, Victoria is used to catching audiences off-guard. Instead of, say, an "R&B diva," they see a black woman commanding attention with her electric guitar. "I think it's just that we were so silenced that people don't know what to do with a black woman," she says, "unless it is displayed to them, given to them in a way to consume that they are already familiar with." With her first full-length album, the 29-year-old wanted to find the musical language for what she felt at 6 and 17 and 23. "I think that I sing now with more conviction," she says. "I feel more sure now about my words. It doesn't necessarily mean that they're flattering. I know a lot of the songs don't paint me as a great person; that's not what I'm here for. But I feel the agency to own the experiences that I went through and not have to be like, 'Sorry. Sorry.'" Then again, Victoria's really never been one to apologize for who she is. The American South - rich ground for the arts, shade trees, sweet tea, prejudice and poverty. Adia Victoria's debut album, "Beyond The Bloodhounds" draws more from the latter. Jewly Hight of member station WPLN has this profile. JEWLY HIGHT, BYLINE: Adia Victoria Paul spent a good bit of her South Carolina childhood in the foothills of the Blue Ridge Mountains, but you won't hear her wax nostalgic for a pastoral paradise. She remembers an unforgiving landscape. VICTORIA ADIA PAUL: Nature terrified me. Nature, like, the constancy of it and its just kind of, like, cold disregard for mankind - I don't think that I could ever try and aw shucks that up, folksy that up. I would never disrespect what nature has meant to me and be like, oh, well, you know, I'm just a country girl (laughter). PAUL: (Singing) Here's a song for Campobello, y'all. That [expletive] river ate my patent leather shoes. Here's a song for my gram and grandpa, Old Billy with the blind man blues. HIGHT: In case you didn't catch that, the artist, who goes by her first and middle names, is singing about the time a river swept her precious patent leather shoes right off the bank. Those were her church shoes, and they saw a lot of use. For years, life revolved around her Seventh-day Adventist congregation. She and her siblings even attended the church school. And the hymnal was Victoria's main source of music. PAUL: So I kind of had this veil shrouded around me. But there still were small ways that the world would, like, break though the veil. Like, I remember Michael Jackson as a little girl. Like, I was like - he's not like us. Like - have you seen him dance? HIGHT: She got thrust into that secular world when her single mom put her in a public high school. But Victoria couldn't identify with her schoolmates' comfortable, suburban lives. As a young woman of color in a family that often struggled to get by, she saw through the promise of that white picket fence. PAUL: And I just realized - OK. Wait a minute. Whatever it is that you're trying to sell, I don't want this. Like, I don't want my life to look like this. And so when I went to high school, it was with this attitude of - well, OK, I have to be here by law. But I'm not going to - I'm not going to sing and dance for you. And I'm not going to impress my teachers. I don't care about letters of recommendation. HIGHT: Victoria dropped out of school and wanted out of the South altogether. She saved up for a plane ticket to Paris, determined to learn French. Then, she caught a train to New York to try Northern city life. But by 21, she'd moved to Atlanta and fallen for delta blues. blue. PAUL: I heard black inner lives for the first time. I heard this kind of soundtrack to what I was already going through. I heard that, like, fully formed in these recording where I was just like, y'all went through it, too. Like, y'all fought with rivers. And you've been tried, like, by the same fire that I've been tried, you know, as a black Southerner. And I was a ghost at that time in Atlanta. I was just, like, I need someone to tell me who I am. Like, I need to see what I'm going through, like, out there. And so I had to go back about 80 years, but I found it. PAUL: (Singing) Don't you tell me that my baby is gone. Don't you tell me that my baby is gone. He left me standing here all alone. Come on. Come on. HIGHT: At first, she only played songs for her cat. After she joined her mom and sisters in Nashville, they overheard her singing and started requesting their favorites. But it took an awakening for Victoria to get serious about putting her music out there. PAUL: When I saw that the things I was singing about and that were frustrating me - I was seeing it played out on the news, like with the Black Lives Matter movement and Trayvon Martin and Sandra Bland and Tamir Rice, where I was just, like, like, OK. I have to say something. Now I have to put myself out there because my art is speaking to what's happening now. And so I just, like, here it is. PAUL: (Singing) I don't know nothing 'bout nothing but my own misery. Oh I've been dreaming of swinging from that old palmetto tree. And I've been thinking about making tracks. But the only road, I know, it's going to lead me back. I'm stuck in the South. I'm stuck in the South. I'm stuck in the South. HIGHT: Victoria's presence was so powerful that drummer Tiffany Minton offered to join her band before she'd even heard the music. Just talking with Victoria made that much of an impact. TIFFANY MINTON: Because what she's saying is challenging for a lot of people, particularly white people, which tends to be a lot of our audience. And so it draws them to a place of defensiveness or disconnection. And I think she's able to challenge them with grace and dignity, but also with, you know, a fierceness without apology. And I love that she stands up for herself and her artistic vision. HIGHT: By now, Victoria's used to catching audiences off guard. Instead of, say, an R&B diva, they see a black woman commanding attention with her electric guitar. PAUL: They think it's just that we were so silenced that people don't know what to do with a black woman unless it is displayed to them - given to them in a way to consume that they are already familiar with. PAUL: (Singing) Say you're looking for something make you feel anew. You don't believe in God. Hey, whiskey will do. You say you're looking for something to make you feel anew. You don't believe in God. Well, whiskey will do. HIGHT: With her first full-length album, the 29-year-old wanted to find the musical language for what she felt at age 6 and 17 and 23. PAUL: And I think that I sing now with more conviction. I feel more sure about my words. It doesn't necessarily mean that they're flattering because, I mean, I know a lot of the songs don't paint me as a great person. That's not what I'm here for. But I feel the agency to own the experiences that I went through and not have to be like, sorry, sorry. HIGHT: Then again, Adia Victoria's really never been one to apologize for who she is. For NPR News in Nashville, I'm Jewly Hight. PAUL: (Singing) Oh, you ask me a question, I'll tell you a lie. So don't be looking at me acting all surprised. Yeah, you ask me question, I'll tell you a lie. Transcript provided by NPR, Copyright NPR.